Kids love Halloween. Kids love jokes and riddles. 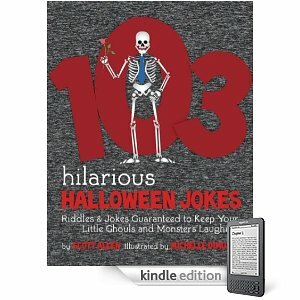 In 103 Hilarious Halloween Jokes – Riddles & Jokes Guaranteed to Keep Your Little Ghouls and Monsters Laughing, kids get the best of both. Vampires, ghosts, ghouls, and goblins – they all get the funny treatment in this laugh-out-loud joke book.